Wednesday night was just another day at the office for Syracuse. The Orange, who trailed #10 Duke by ten points in the first half, scrapped back into the game, culminating their effort with a defensive stop and a three-pointer from John Gillon that hit the glass just after the buzzer sounded and fell through the net for a 78-75 home win. Over 30,000 fans in the Carrier Dome immediately responded in the only acceptable manner, losing their minds. 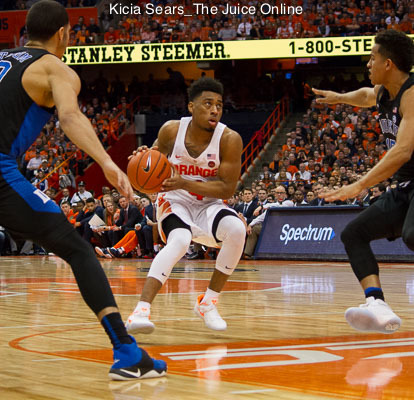 The Syracuse rally turned a game where the Blue Devils had a comfortable lead into a tense affair in which neither team held more than a one-possession lead in the final 13:35. When the Orange survived, they found themselves holding a 17-12 overall record, a 9-7 ACC record, and perhaps most the important of all, a third victory over a top-ten team as they chase an elusive NCAA Tournament bid. The Blue Devils, who saw their seven-game win streak snapped, slid to 22-6 overall and 10-5 in conference action. SU did most of their work after halftime, scoring 53 points after intermission. The Orange offense was sizzling in the second half, hitting just under 71 percent from the field, including four-of-five threes, and added 15-of-17 foul shots for good measure. 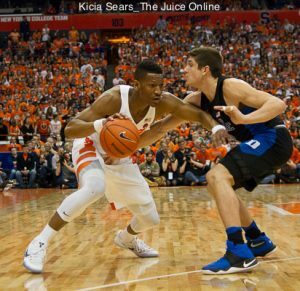 The hot shooting offset a night when Duke outrebounded Syracuse by eight, including grabbing 16 offensive boards. The Blue Devils took command of the game in the early minutes, needing just over 60 seconds to run up seven straight points and take a 12-6 lead just over five minutes into the game. The Orange immediately responded with a 7-0 run of their own. Tyus Battle scored off a nice move in transition to start the burst and Taurean Thompson finished off the glass for a second score. Andrew White III swished a three off the left wing to cap the streak and give SU a 13-12 lead. SU’s lead was short-lived, as the Blue Devils scored a half dozen points to go back on top. Following two pairs of free throws by the Orange, they blitzed SU with another eight points, taking a 26-17 lead with just over five minutes left in the opening half. Those foul shots were the only points for Syracuse in a span of nearly eight minutes. Duke alternated scores with the Orange over the remainder of the half, eventually grabbing a ten-point lead in the final minute. John Gillon coaxed a circus lay-up through the net on the last SU possession of the half, cutting the deficit to 33-25 at the break. The second half was a different story for the Orange, as they needed just over seven minutes of play to roll up a pair of 7-0 streaks to take the lead. Gillon played a major role in both runs, getting a three-point play and a transition basket in the first and adding a lay-up and pair of free throws in the second. That pair of foul shots gave Syracuse their first lead of the second half at 49-47. Over the final third of the game, the margin never left the range of Duke holding a three-point lead and SU being up by a deuce. With under 2:30 remaining, the Blue Devils got a three to take a 73-72 lead and took a timeout. During the break, the officials reviewed a three-pointer from Battle nearly three minutes earlier and corrected it to be a two-point basket, meaning the Orange actually trailed, 73-71. Battle calmly shook off a Blue Devil defender to create space and swished a jumper to knot the game at 73. Duke got a pair of foul shots on the ensuing possession to lead by a pair once more. After a scoreless trip for each side, Gillon absorbed contact on a foray to the rim and got a lay-up to drop in to tie the game at 75 with under 40 seconds to play. Syracuse held their ground on defense, eventually corralling the ball and getting it to Gillon. The point guard turned on the jets into the frontcourt and pulled up from 25 feet. Three Duke defenders were around him, but gave him enough space to ensure they did not foul him. Gillon rose, releasing the ball with just over a second on the clock, banking home a game-winner and possible season-saver. John Gillon erupted in the second half, posting 19 of his 26 points after the break. Gillon shot 9-of-14 from the floor, including 3-for-4 from deep, and hit all five of his foul shots. Tyus Battle had one of his best games as a freshman, adding 18 points. Tyler Lydon and Taurean Thompson each added 11 points with Lydon leading the team with nine rebounds. Luke Kennard drained five three-pointers in the game and led all scorers with 23 points. Jayson Tatum posted a 19-point, 13-rebound double-double, but actually reached double figures in both categories by halftime (14 points, ten rebounds). Amile Jefferson chipped in with 14 points. The Orange have another stiff test on Sunday when they travel to #7 Louisville for a rematch with the Cardinals (22-6, 10-5). 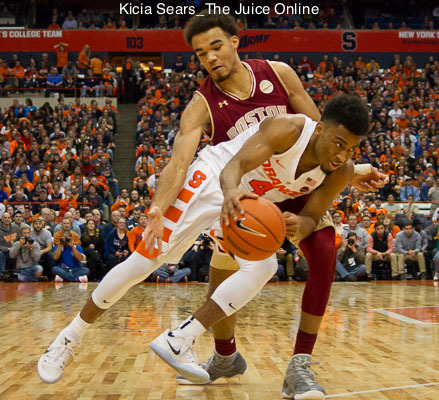 The Cards outlasted Syracuse for a 76-72 overtime win at the Carrier Dome less than two weeks ago. SU rallied from a 14-point first half deficit in the game. Leading scorer Donovan Mitchell, who averages 15.8 points per game, had 16 points in the first game before fouling out. Andrew White III paced the Orange with 22 points in that contest. CBS will televise Sunday’s game, which will start at 2:00pm Eastern.